I am making fungal work for an exhibition. I plan to make a mycorrhizal system in the gallery, that is, a system in which fungus and plants have a symbiotic relationship. A challenge with this is that most mycorrhizal fungus doesn’t form visible mushrooms, either at all or only after having developed a medium- to long-term relationship with its plant partner. After consulting with Adrian Ogden at https://www.gourmetmushrooms.co.uk, I have decided to grow morels, which should create microsclerotia – yellow to orange bumps containing a concentration of nutrients. I have not grown morels before. 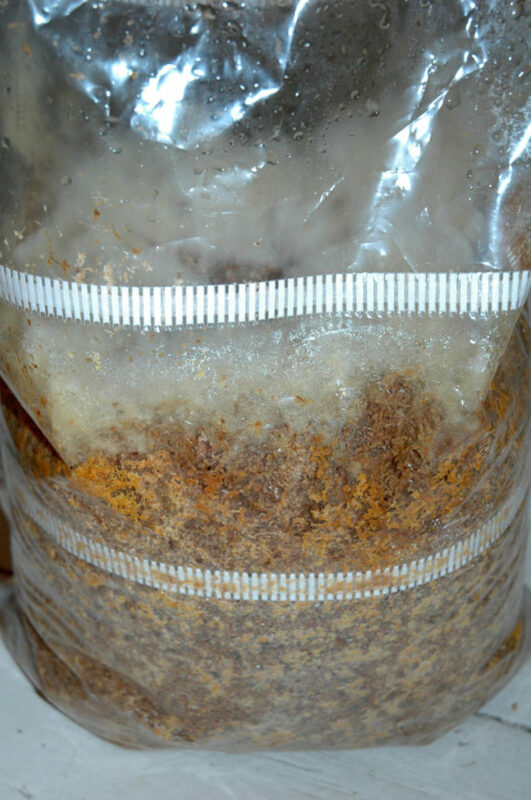 Adrian says my substrate should be colonised in 5-6 days, but so far it only looks about 30% colonised; I will consult with him on ready it is ready for the next stage, the shock, when you drop the temperature in order to stimulate the next stage of growth. I am trying these on various different substrates, and using two different pasteurisation methods – a rough and ready soak and drain, and a more precise attempt to get a 1:1 ratio of substrate to boiling water. I also have another eight species to start off, which have different coloured spores that I thought I could harvest and use with tempera in a painting. But what I’ve learned – yet again – is that everything takes far longer than I expect. Last week I set up 11 growing trials of morels, reishi and enoki, and the whole process took 12 hours. In addition, all the trials have to be monitored, and once the mushrooms start forming they have to be kept just the right amount of moist. So I am considering holding off on these extra species – after all, I don’t even currently plan to make a painting; it was a late night bit of excitement at possibility. On the other hand, there’s no point them going to waste, so I will probably start them off next week. My plan for the artwork is that it will be both a mycorrhizal system and a diagram something relating to mutual aid. As a mycorrhizal system, it will feature morels and saplings of some of the trees that morels typically grown in association with – ash, oak and sycamore. My good friend the excellent Jed Picksley is going to pick me some saplings from Earthworm Housing Co-op in Herefordshire where she lives, and fellow occupant and permaculture teacher Tomas Remiarz will drive them up to me. (I already have hazel and holly saplings from my garden, but they do not seem to form particularly mycorrhizal associationsn and certainly not with morels – may be worth a punt though). At the end of the exhibition, people can take the trees, whose future growth will hopefully be accompanied by fine crops of morels. The work is also likely to feature oyster mushrooms, for their detoxification properties, beauty and ease of growing. And possibly plantains (plantago lanceolata), which I can get from my garden and which have a very strong affinity with mycorrhizae. I have been told this by the soil scientist Richard Bardgett, who I met to talk about the subsoil realm last week; apparently plantago is frequently used in experiments with mycorrhizae. I am quite stuck on this bit at the moment.